The Association of Indian Management Schools (AIMS) was formed in 1988 as a network of management schools in the country at the National Conference of the Heads of Management Education Institutions on “National Education Policy and its Implications for Management Education in the Country” held at Indian Institute of Management, Bangalore in April 1988.AIMS has since grown into a powerful body of B-schools in the country with a membership of over six hundred Institutes. AIMS is one of the largest networks of management schools in the world. The Mission of AIMS is to function as the professional association of management education concerned with quality of management, manpower training and development, management research, curriculum development and to take all such steps on its own or in collaboration with other agencies for the promotion of Management Education in India. AIMS functions as the truly representative body of management education in the country, safeguarding the interests of the sector and contributing to quality improvement on a continuing basis. AIMS must make determined efforts to develop and project its identity as the national network of the management schools system in India with its presence, voice and impact felt that is respected in relevant national management and policy fora. This calls for rededicated commitment to its mission and well articulated programmes of action. 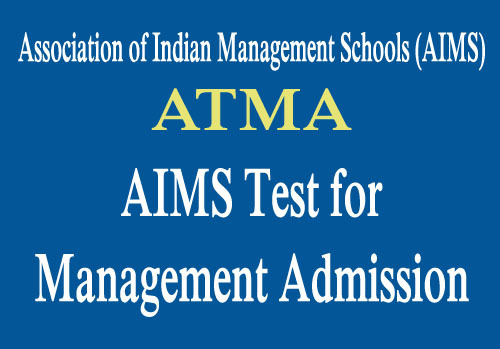 ATMA is a high quality test, the scores of which can be used in the admission process, as a reliable predictor of academic performance in post graduate management programmes, including functional, sectoral and computer management programmes offered by various institutes/universities. ATMA seeks to become the benchmark test in the world of management education. It is focussed on the student. ATMA does not require any specific prior knowledge of business or other subject areas nor does it seek to measure achievement in any particular subject area. The test is designed to assess the aptitude of the student for higher management education and primarily consists of sections on verbal skills, quantitative skills, and analytical reasoning. Questions are of the objective type. ATMA makes the process of applying, registration, payments, grade cards and selection of center simpler and more efficient. Similarly, for Management Institutes, it makes the processes involved in admissions, including access to scores of students simpler and efficient. ATMA Committee, comprising eminent academics and administrators, design, supervise and guide ATMA. The First Chairman of ATMA committee was (late) Prof.Ramaswamy P Aiyar (former Director IIMC), followed by Padamshree Fr. R D’ Souza (former Director XLRI, Goa Institute of Management) till early 2011. Prof (Dr) Prabir Pal ( former President, AIMS and Director, RCM, Bhubaneswar) and Prof (Dr) Rakesh Khurana (former President, AIMS and present Chairman, Knowlege Network India Pvt Ltd) were Acting Chairmen during January – August, 2011. Currently, Dr Apoorva Palkar (Director, Sinhghad Institute of Management and Computer Applications) is the Chairperson, ATMA Committee. •	To provide a dynamic network of institutions engaged in Management Education, Training and Research in India. •	To contribute to the development of Management Education, in all its aspects, both qualitatively and quantitatively and to help maintain and improve standards of teaching, research and examination. •	To undertake, organize and facilitate training programmes for in-service personnel and their professional development. •	To help in the accreditation process of Management Education Institutions by suggesting specific criteria and evaluation standards of institutions and their programmes. •	To undertake and provide for the publication of newsletters, journals or other communications for dessimination of ideas and developments in the field of Management Education to member institutions. •	To institute or cause to set up local/regional chapters at convenient locations in India and to promote the objects of the Association more effectively. •	To cooperate, collaborate and interact with other Associations or Societies – National and International – for helping the cause of Management Education and Research, including training and consultancy. •	To take steps for the development of management literature, case studies, teaching materials, books, etc., relevant to the Indian context. •	To actively promote linkages between Management Education Institutions and Industry, Business and Government. •	To strengthen institutional capabilities through faculty development, faculty exchange and enable better use of infrastructural facilities. •	To organize seminars, conferences, management training, research, consultancy and publication activities in furtherance of the objectives of the Association. •	To launch common management training, research and consultancy ventures outside India on its own or in collaboration with other management institutions and networks, industries, inter-governmental agencies and other funding organizations. •	To associate and work in close collaboration with International Management Networks with a view to furthering the cause of Management Education and Management Development world-wide. AIMS represents Indian Management Schools in various International fora such as European Foundation for Management Development (EFMD), Association to Advance Collegiate Schools of Business International (AACSB), Association of Management Development Institutions in South Asia (AMDISA), Global Forum on Management Education, and Accreditation Council for Business Schools and Programs (ACBSP). As part of its policy of widening its global networking for facilitating sharing of experiences and developmental activities in management education at global level, AIMS associates itself with some of the leading international networking organisations. For this purpose, AIMS has signed Reciprocal Membership Agreements for five years with EFMD, ACBSP and AMDISA. Many mutually beneficial programmes are being worked out in collaboration with ACBSP and other associations – for example, the first meeting of the ACBSP’s 10th Region was held as part of AIMS Convention during August 2011; AIMS collaboration with ACBSP is in terms of AIMS helping Indian business schools in the process of getting international accreditation, etc. A few international conferences are also planned in India involving one or two of these international netwoking associates. AIMS had a strong presence at Global Forum meet during October 2005 at Santiago, Chile; AACSB and EFMD Annual Conference during April 2006 at Paris and AACSB Conferences at Tampa, Florida USA in April 2007, at Hawai in April 2008 and EFMD Conference at Brussels, Belgium in June 2009; AACSB Annual Conference in April 2010 at Anaheim, California, and ACBSP Annual Conference in June, 2011.